Accessories for hair made in unique pieces, but can be customized, hairpins that I propose in five variations. The yellow version: Hairpin made of sunshine yellow lace wrap and mini red PomPoms for the heart. 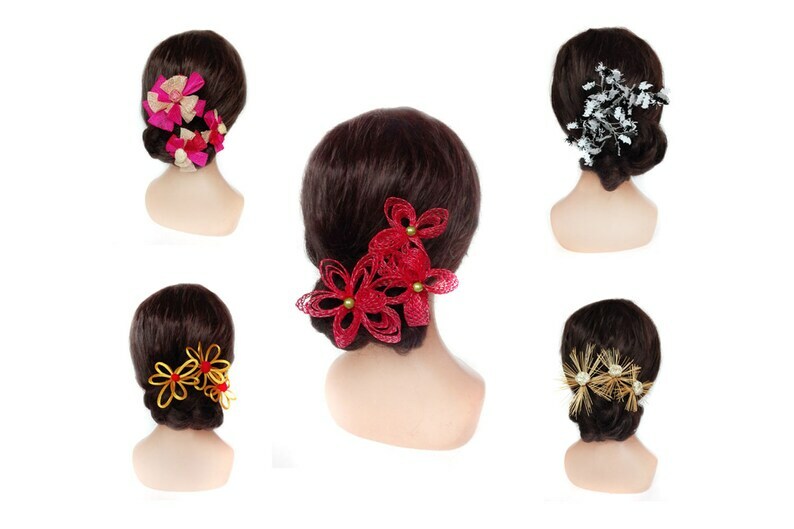 Lightness, this hair accessory will create a hint of yellow and red in your hair with delicacy. For a wedding in red, this PIN is Bobby, peak bun or hair pin made in Plait vialaton red and green beads. The diameter of the cuff is 9/13 cm. Pink version: pins, bun, hair clips, hair jewelry or hair picks. to accessorize your hairstyle for formal or everyday with a hint of pink floral. The cuff is made of sisal in different shades of pink and the flowers have a diameter of 8 to about 6 cm. The diameter is about 12/9 cm. For the beige version: Sun-haired Spades to accessorize your hairstyle while in tenderness. You can wear the pins together or separately. The diameter is 7/9 cm. The headdress is made of buntal fiber and synthetic Twine for the Center button. For more information, don't hesitate to contact me.